Hey there! 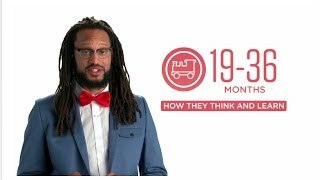 I’m Stephen Bracket, bringing you the Colorado Early Learning and Development Guidelines’ video for 19-36 months… How they think and learn! Making up games and using their imagination. And doing simple chores, like helping to set the table. Make reading time more interactive. Ask them questions like, “What do you think will happen next?” and talk about the story so far. One of the best things you can do for a child at this age is to set them up for success. They want to be independent but need your help. Keep a stool by the sink so that they can wash their hands by themselves. Give them actual cups, so that they can practice drinking without spilling, and give them ways to stay organized, like toy bins and shelf space. To learn more about what most kids are doing from 19-36 months, check out the Colorado Early Learning and Development Guidelines at: www.earlylearningco.org. Hey there! I’m Stephen Bracket, bringing you the Colorado Early Learning and Development Guidelines’ video for 19-36 months … Emotions! And using emotions in imaginary play, like crying when their toy is sad or laughing when they make up a silly joke. “Catch” them being good. Encourage them when they follow direction or solve their own problems. And… avoid trying to “fix” everything. It can be a little tough to watch, but children need to learn how to fail so they can learn to succeed. This is also a great age for them to start learning how to “self-soothe.” Show them ideas for how to calm down and comfort themselves, like with a favorite toy or by humming their favorite songs. Having the ability to manage their emotions will be really helpful as they get older. Check out the Colorado Early Learning and Development Guidelines website at www.earlylearningco.org, where you can download the guidelines, find links to more resources and watch more of our videos. And remember… all children learn, grow and develop differently. If you’re concerned about your child, talk to your pediatrician. Hey there! I’m Stephen Brackett, bringing you the Colorado Early Learning and Development Guidelines’ video for 19-36 months … Learning and interaction! Some of the milestones you might be seeing at this age center around learning new skills and interaction with the people around them. Share and take turns as you play with them. When it comes to how you want your child to interact, be a good role model! During playtime, practice taking turns with who leads the game. Demonstrate fair play, including how to be a good winner and a good loser! And, remember, they’re watching every move you make, so set a good example! To learn more about what most kids are doing from 19-36 months, check out the Colorado Early Learning and Development Guidelines at: www.earlylearningco.org. Most importantly, if you feel your child isn’t hitting some of these milestones then please… call your pediatrician. By working as a team, you can help your child can get all the support he or she needs. Hey there! 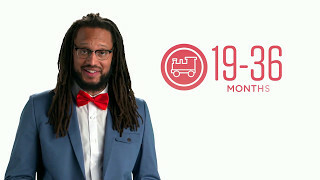 I’m Stephen Brackett, bringing you the Colorado Early Learning and Development Guidelines’ video for 19-36 months … Grow and stay healthy! Some milestones at this age may center around physical skills. Play outside with them as much as you can. And just generally stay active with them. 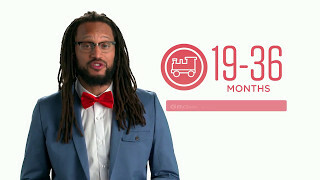 If you’d like more information on what to expect from your 19-36 month old, check out the Colorado Early Learning and Development Guidelines website at www.earlylearningco.org, where you can download the guidelines, find links to more resources and watch more of our videos. And remember… all children learn, grow and develop differently. If you’re concerned about your child, talk to your pediatrician. Hey there! 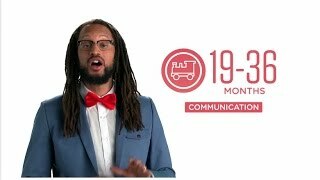 I’m Stephen Brackett, bringing you the Colorado Early Learning and Development Guidelines’ video for 19-36 months … Communication! Some of the milestones you may be seeing at this age center around how your child thinks and expresses themselves. And… asking you “why”… possibly hundreds of times a day! When your child is reaching for a toy or trying to solve a “problem,” wait to offer help until they ask for it. Sometimes, when a child asks you “why,” they’re not always asking for an actual answer. Sometimes they just want to chat, but aren’t sure how. So, next time they ask you “why”, try asking them what they think before answering. When they tell you what they think, actually listen to the answer. And, give them the time they need to work out what they want to tell you. It may take them several minutes to pull all the right words together, but they’re still practicing, so be sure to be patient with them. Here’s something else to keep in mind when it comes to learning in these early years. Most toddlers have little to no control over their impulses and struggle with remembering things. So, when you’ve had to tell your toddler “no” over twenty times because she keeps decorating herself with magic markers or trying to set the goldfish free, that’s pretty standard stuff. Just take a deep breath and be patient. They’ll get it. To watch the rest of this video series and learn more about the Colorado early learning and development guidelines, check out our website at www.earlylearningco.org. Toddlers at this age are developing independence and gaining a strong sense of self-identity. More and more, they insist on working on tasks by themselves and exerting control over their environment. They have a growing interest in books, art, toys, and other activities. They are better at communicating and understanding the world around them. Pedal a tricycle, climb ladders, or walk backwards a few feet. Play games that require physical actions, like rolling, throwing, and kicking balls or chasing. Use thumb, index, and middle fingers to draw or write with a crayon, marker, or pencil. Provide art materials like large crayons, markers, and paint brushes or use play dough and clay to help the toddler develop squeezing, rolling, patting, and pounding skills with their hands. Play with others by building a tall tower of blocks with one or two other children or handing a peer a block when building. Provide opportunities to play with other children in a variety of settings. Model how to act and suggest words to help them learn to share. Move in and out of pretend play roles or tell other children what they should do in their roles. Provide time and toys that encourage imagination by playing specific roles (e.g., cooking and eating). Read about diverse families and people. Recognize their ability to identify their own characteristics, such as size, hair color or gender. Provide opportunities to interact with other kids of diverse cultures, ethnicities, and abilities. Insist on zipping up a jacket or communicate, “Do it myself!” when a parent tries to help. Allow them time to do things for themselves and acknowledge the actions using words of encouragement. Act out different emotions during pretend play by “crying” when pretending to be sad and “cooing” when pretending to be happy. Share and discuss books and pictures of people showing emotions and help the toddler identify feelings as they happen. Sing songs about different feelings (e.g., “If you are happy and you know it”). Show a substitute teacher or new babysitter that they like a back rub during naptime by patting their own back while lying on the mat. Allow them to meet their own physical needs with comforting objects or actions (e.g., sucking their thumb). Provide them with a sense of control by providing a choice of acceptable options (e.g., “You can have water or milk.”). Talk with the toddler about rules, limits, and choices and why they are important. Know the names of most objects in their typical environment. State simple requests and acknowledge the toddler’s responses and actions. Use hand motions and other body movements when singing or telling stories. Talk about what you are doing (e.g., “I am going to wash off this table and then we can sit down and eat.”). Use a total of 300–1000 words. * NOTE: Kids who speak more than one language may mix words from different languages in the same sentence. Allow them to participate when telling, singing, or reciting stories and songs. * NOTE: You can help when they mix words from different languages by repeating what they say using all words in the same language. Resist the temptation to rush or interrupt them as they think of how to say something or answer a question. Help the toddler understand how her actions affect others (e.g., “Jasmine is sad because you pushed her. How can we make her feel better?”). Provide opportunities for them to watch and practice cause and effect (e.g., push and pull toys, rolling items down a hill). Play make-believe. This may look like the child stirring “cake batter” while holding an imaginary spoon. Provide opportunities to play pretend with simple make-believe toys, such as dolls, stuffed animals, dishes, and blocks. Encourage imagination by joining them. For example, play make-believe with them, take on a role and follow their directions. Start and follow through with some personal care routines like drinking from a cup without spilling much or helping set the table for lunch. Provide tools, like a stool at the sink or a coat hook within reach, to allow them to begin to do things themselves. Show them how to do it and assist when needed. Place the triangle piece into the puzzle without first needing to try it in the round or square space. Wait until they show the need for help before helping. Help only as much as needed and talk aloud about how you or they solved a problem. Recall an event in the past, such as the time a family member came to school and made a snack. Provide photos and picture books of past family events, commonly seen animals, or things of interest to them. Pound the play dough with a hammer while talking with a peer. Allow adequate time for them to explore and get involved in activities.